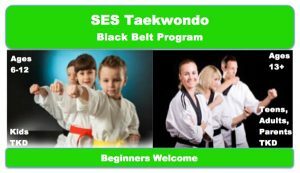 SES Taekwondo provides a range of martial arts based activities in Narre Warren including traditional Taekwondo, self-defence, bully prevention activities, sparring development with a focus on physical fitness leading to a healthier life style, SES Taekwondo prides itself in being a leader in martial arts for kids, teens and adults. 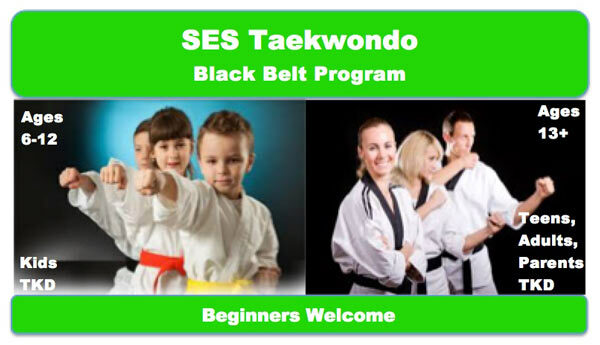 At SES Taekwondo we have classes for ages 6-12 and then Teens, Adults and Parents. We’re all about positive teaching methods that encompass discipline where required to ensure all students receive the best possible training practices available. You won’t see an instructor enforce push ups to gain discipline at our club – push ups are a great exercise, why would you punish someone with it? Instead, we encourage kids to be their best by rewarding them for achieving their skills and at times a raised voice is used, however, discipline comes from wanting recognition and attention for personal achievement and we have plenty of ways to do that. Kids want to train at our club because they feel valued, they feel important, they feel a sense of belonging and most of all, they can see their achievements quickly and in a very tangible way. Teens, Adults and Parents 13 years plus. Senior classes are designed for fitness, flexibility and fat loss. You’ll have so much fun and be so ingrosed in the skills you’re learning you’ll forget you’re exercising. Taekwondo for teenagers can be a real guiding rod for making good choices and having a focus to put all their energy into. The teenagers at our club often make great friends at training that they end up socialising with outside the dojang too. Positive teenagers living positive lives in and out of the dojang – fantastic!!! The following information is designed to paint a clear picture of what is required and what you will achieve on your journey to black belt and beyond. Going from white belt to black belt takes around 4-5 years on average however in some circumstances may take longer. We’ve done our best here to cover all the FAQ’s at each stage. Each stage is different and may have different requirements to get to the next level. We’ve also given many tips on what to expect along the way so there are no surprises, or things you may not have been aware of. As parents, I would encourage you to read ahead, and not just your (child’s) belt level to get an overall picture of the entire journey. This will really help when your child becomes a bit disheartened at not earning stripes so easily in the higher levels and possibly missing gradings. Missing gradings is not the issue per-say, that’s expected to happen, knowing the road ahead and managing your child’s perspective is the key to keeping them on the path. We make this guarantee to every person who joins our club. 100% guarantee that you will make it to black belt if you don’t give up of course. We can’t guarantee how long it will take – everyone learns at different rates, some people can make training a lot more than others, children’s age also plays a major part, but as long as you don’t give up, you’ll make it! Becoming a black belt has nothing at all to do with skill, nothing! Every single black belt at our club has one thing in common though – we refused to give up when the going got tough. Somehow we found the will and the way to continue. Quitting is easy and I’m sure most of our black belts seriously considered it more than once, but we didn’t quit, we found a way and made it. No one ever said it was going to be easy, or that everything to do with Taekwondo was always going to be fun. There will be great times and there will be tough times. One thing is for sure though – it’ll be worth it!!! Ask any black belt. Overview: This program is designed to take students all the way through to black belt eventually. Recommended training frequency: Twice a week, Tuesday and Thursday is usually enough to get through to the yellow belt grading in one term. These are the best sessions to gain skills for grading and comprise of Poomsae, Self Defence and other general Taekwondo elements such as stances, body positioning, kicks, blocks, punches etc. As this is most likely your first grading there are a few things you need to be aware of. We will keep you informed as we get closer to grading but have summarised it here as well. Students are eligible to grade twice per year upon approval from head instructors. The instructor will go through the terminology questions frequently in class and the questions/answers are all available in the training guide that is provided to all students. Overview: From this level onwards a rotational training schedule kicks in. That means that every week we are concentrating on particular skills. We cover the entire grading syllabus over a 3 week period and repeat that cycle up to the grading. It’s very important to keep training regularly so you don’t miss out a chunk of the syllabus and have to try and catch up later. Recommended training frequency: Twice a week, Tuesday and Thursday is usually enough to get through to your next yellow belt grading in one term. These are best sessions to gain skills for grading and comprise of Poomsae, Self Defence and other general Taekwondo elements such as stances, body positioning, kicks, blocks, punches etc. Bonus class: Once you have successfully graded to yellow belt, you are now eligible to attend our premier Sparring Development Program on Saturdays. This class assists all students with building confidence in the area of Taekwondo Sparring (Fighting). Inter Club Poomsae and Sparring Development Tournaments – All students must enter at least one Tournament and compete in either Poomsae or Sparring or both sometime before grading to red belt. A list of the compulsory and recommended protective gear I can be obtained from SES Taekwondo Instructors. Sparring class please note that there are no additional class fees to attend this class. It is expected that all blue and red belt students attend regular sparring classes as development in this area is important for future gradings where the sparring becomes more intense. Without regular sparring training or practice, students may find sparring a little more difficult to handle for example, contact sparring begins at red belt level and in addition when students grade for their black belt they are required to undergo up to 8-10 continuous rounds of contact sparring so the more practice at the lower level the better. Overview: Blue belt class is a big jump up form yellow belts both physically and technically. This is where we expect some members to start missing gradings. A lot of that has to do with age and training frequency. There are 3 extra skills that will be learned, practised and performed at grading throughout this belt level. At blue 2 stripe – One Step Sparring. At blue 3 stripe – Board breaking and contact sparring. Training frequency: At least twice a week is recommended. The best sessions to gain skills for grading are the belt and age specific lessons. The Poomsae/Self Defence classes are also good either as an extra or a “makeup” session. Overview: Red belt class is a big jump up form blue belts both physically and technically. Many people miss gradings at this level. If you’ve been training twice a week up to this point you should look at upping that at red belt level. Training frequency recommended: Three times a week which includes the Sparring Class. Overview: Red 3 stripe is the most difficult and demanding step so far on your journey to black belt. Moving beyond this point takes extreme dedication, intense training and tremendous family support. The next grading from here is to Cho Dan Bo (Probationary Blackbelt). Cho Dan Bo is basically half of your black belt grading so the skills need to be precise. The most difficult aspect is re-learning all of the coloured belt patterns. This takes a great deal of time and students need to make the time to practice at home as well as at training. You will never get enough hours at training alone to get to Cho Dan Bo. Home practice is essential. Most students will remain at this level for 6 – 12 months. Family support is crucial at this point to keep them positive and focussed on what they are about to achieve. It’s not an easy task but its definitely worth it! Overview: Cho Dan Bo is the probationary black belt level. When grading to your black belt you’ll be required to repeat all of your Cho Dan Bo grading which includes: 8-10 rounds of contact sparring, weapons defence, Koryo pattern in Korean. Most students will remain at this level for 6 months or so. The black belt syllabus is to be used for this and all future gradings. The file is available for download on the website. Overview: Congratulations, you’ve done what most people have tried and failed to do. Achieving your black belt is a major life accomplishment but it doesn’t have to end there. We recommend that you ease off the training intensity and just enjoy your black belt for a while – you deserve it! Twice a week is enough just to keep in touch with your skills and when you’re ready, there’s a whole bunch of new skills to learn for your next grading. When you’re about 6 months away from your next grading we recommend that you step it back up again to a Cho Dan Bo intensity. Training frequency: Twice a week until your 6 months away from your next grading – then up to 3 time a week. There are also minimum periods between dan gradings as set out by the Kukkiwon (World Taekwondo Head Quarters in Korea). The easiest way to remember it is this: however many dan stripes you currently have on your belt, that’s the minimum amount of years to grade to the next dan level. For example, if you’re second dan you need to wait 2 years till third Dan. The minimum times are calculated from the time your Kukkiwon certificate is stamped in Korea, usually 3 months after your actual grading. Check out for Training Fees. Our totally unique programs give a great grounding in excellent martial arts fundamentals such as kicking, punching, footwork, self defence, as well as developing motor skills, gaining confidence, learning about structure, and most importantly, THE KIDS LOVE IT! There are no limits to what you can achieve and we at SES Taewkondo will assist you every step of the way to achieve your goals.